I am developing a broadcast receiver for incoming calls in Android and on getting incoming calls I want to inflate a pop up over the native incoming call screen. The code is not executing in Android 4.1 (Jelly Bean), but in other versions it is working. I have tried almost all ways I can do. This code is displaying an translucent activity over the native call screen, and it doesn't block background controls, like picking up the phone. But I want it like true caller. 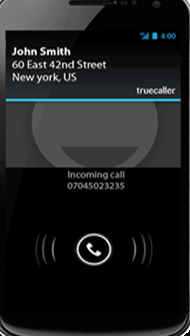 I have attached an snapshot on how the true caller is displaying a window on the incoming call screen. How can I achieve this functionality for an Android app? After bounty also I am not getting the exact thing I am looking for, but I will get back to all; I am working upon it. Anyway, this code works for most Android phones. If anybody is going to use and catch the solution for it, please write here so that everybody can get the benefit. I tried to implement Toast in the broadcast receiver's onReceive method because toast is a native component of Android, but it is also not getting displayed in Android 4.1 (Jelly Bean). My idea was to implement Toast in the broadcast receiver's onReceive method and afterwards changing its design according to our needs and tuning its duration of display. But one more problem is that findViewById doesn't work in the broadcast receiver, so I think we have to make a LinearLayout programmatically for customizing the toast. I am not sure that your custom GUI will always be on top of the default one, because the system broadcast receiver and your receiver are both trying to display its GUI on top of the screen. We are not sure which one is called first, but one tricky work to make your GUI on top of the screen is when the phone is ringing call your activity after 1-2 second(s) used handler for that. Try the code before the super.onCreate method. I think after calling the super the code is skipped. Sometime this type of tricks worked for me. and YourActivity will remain as you have created... Note: I am facing some problems also in this code they are here. When the call closed is clolse (missed call or rejected) the activity is not being closed. HERE IS LINK OF SMALL DEMO HOW TO ACHIEVE THIS. I think you shouldn't start activity to achieve the described result. You need a separate view having LayoutParams.TYPE_SYSTEM_OVERLAY set in its layout params. You can position this view wherever you want on the screen, or just cover the whole screen. https://bitbucket.org/gyrussolutions/yaab/src/f01cc8aff690cae1b1107287cb17835b8a3c1643/src/biz/gyrus/yaab/LightMonitorService.java?at=default#cl-338 - the full source code, consider it a sample. 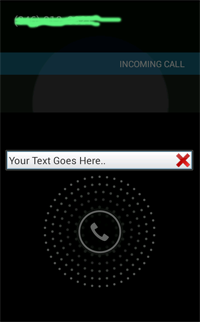 I'm trying something similar, adding an extra button to the incoming call screen. It is working on emulators as well as on a HTC One S (running Android 4.1.1). Something you need to keep in mind is keeping a reference to the overlay view you are adding, and remove it again (call removeView() on windowmanager instance) when the phone goes back to idle (when the listener gets TelephonyManager.CALL_STATE_IDLE), otherwise your overlay will stay on screen. It was LayoutParams.TYPE_SYSTEM_ERROR that made the difference. Not the answer you're looking for? Browse other questions tagged android android-layout android-widget broadcastreceiver android-broadcast or ask your own question. 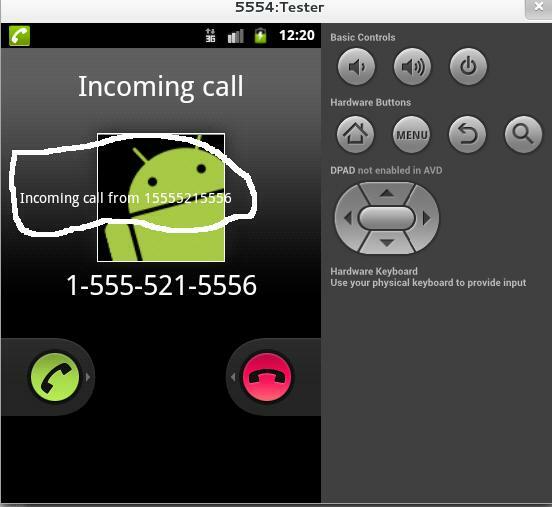 Override the True Caller Popup using System Overlay?